Captain Chip Day is a U.S. Coast Guard licensed Deep Sea Fishing Charter Boat Captain. Capt. 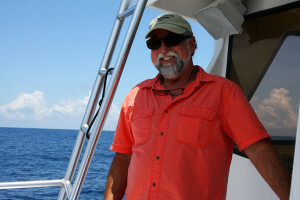 Chip is native of Orange Beach, Alabama and has been fishing the Gulf of Mexico waters for more than 30 years. His charter captain tenure and knowledge not only provides a top offshore fishing experience, but also the most comfortable, enjoyable and memorable charter fishing adventure you can book. Captain Chip will find the fish for you and make sure your trip is fun and exciting. Captain Chip is a proud member of the Alabama Charter Fishing Association (ACFA) and the National Association of Charterboat Operators. ACFA was formerly known as the Orange Beach Fishing Association. You can learn more about the ACFA and its involvement in development of America’s premier artificial fishing reef zone off the Gulf Coast of Alabama HERE.